When I first purchased this online I was hoping for a nice dark bronze that was just a few shades lighter than a brown. It turned out to be exactly what I was hoping for! It's a bright goldy/bronze colour which really illuminates the eyes - even though it is brighter than I expected, I find it compliments my eyes nicely and just adds a little something extra. I put this in my lower water line and add a touch of black mascara to my lower lashes and it just tops off any look. I wear it almost everyday when I want to glam up my everyday winged-liner look. It's so pigmented and really creamy, which makes it ideal for smudging over your lid. 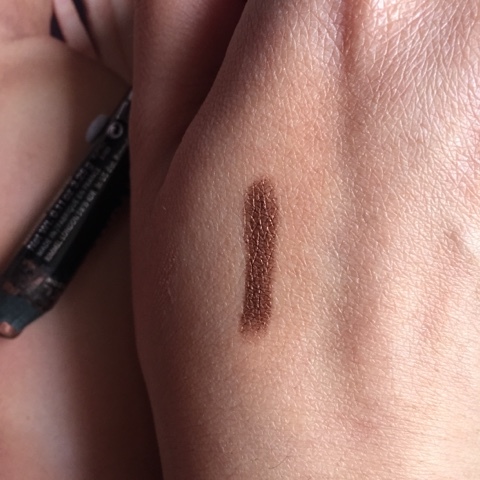 The colour does fade away slightly if you smudge a small amount - but if you layer it up and use your fingers to pat it out, you get a lovely bronzey look. They do 7 other beautiful colours in this range and they only cost £4.49 at Boots. Have you tried this shadow stick? Let me know what colour I should try next in the comments below!